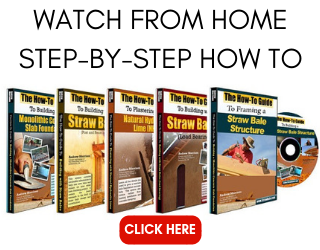 Once you have designed your straw bale house, you need to figure out how many bales will be needed to actually build it. There are a number of ways to go about doing this. One way is to simply make assumptions about the general size of your house and use a bale calculator based entirely on home square footage and roof design. This can work well with simple designs where a home is basically a square or rectangle; however, this method becomes fairly rough when a home has more angles, turns, and curves in the exterior walls as all of those construction details use more bales. Keep in mind, the more custom bales you need to tie, the more waste you will have to calculate into the estimate, even if you use the cut-offs of the bales elsewhere in the building. For a simple table based on square foot calculations, go to http://www.ironstraw.org/balecalc.htm. Another way to estimate your bale needs is to go a bit more in depth and calculate the number based on square footage of the wall surface area. In other words, you calculate the total lineal feet of straw bale wall and then multiply that by the height of the walls. This yields the square footage of wall surface. For a gable roof, measure one half the width of the building at the gable and multiply it by the total height of the gable end. That will give you the square footage of the entire gable as if you took the two triangles and glued them back together in the shape of a square at each gable end. You can then remove the square footage of window and door openings from this number. Once you have all of the openings removed, divide the total square footage by the square footage of your bales. For this, consider a 14″ tall by 36″ long bale would have 504 square inches or 3.5 square feet of bale surface area. 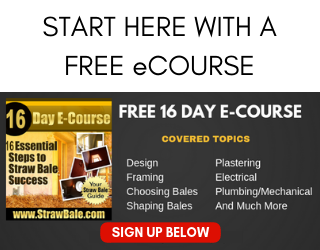 This will give you the exact number of bales you will need to build the structure. I would never recommend anyone try to build a house with the exact number of bales, so add about 10% to the total number you just calculated. An even more in depth calculator can be found at Harvest Homes’ website: http://harvesthomes.ca/resources/calculator/. This calculator takes into account the information outlined in the above paragraph plus the way you plan to stack your bales, i.e. on edge or flat, and deck framed or balloon framed. It also considers many aspects of the construction process outside that of the straw bales in the calculation. Therefore, if you build your home with the same techniques they use, you can get a full estimate of required materials. 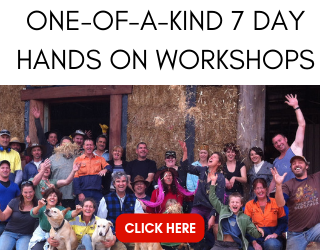 Although this is a very cool service, I don’t recommend using the calculator for anything other than the bales as the techniques used in the construction of their homes will likely differ from your own. Most importantly, I don’t recommend using the lumber calculations as your local building department may want to see actual beam and load calculations for the framing and will not accept a simple “this is what the website said would work”. As you can see, there are a few different ways to calculate the number of bales you will use in the construction of your home. Try to get as close as you can to the “real answer but don’t skimp just to save a few dollars. At about $4 a bale, buying a few extras will not hurt nearly as much as running out and delaying the job while you try and locate bales of the same size to finish the home. You can always use any extras in your garden as mulch or to create landscape seating or walls. A little foundation, mesh and plaster and your scrap bales become a thing of beauty in the backyard.